Populi Financial is designed to help automate student billing for your school. Here's a basic tutorial to help you get going with regular, term-based billing (charges not tied to an academic term are handled on the student's Financial > Dashboard). First... make sure everything you need is set up! There's a good chance you've already done this, but it never hurts to double-check: have you set up your accounts, tuition schedules, fees, and so on? If not, the Getting Started guide will help you get all that nailed down. When you give your students a default tuition schedule, Populi copies that schedule to any term in which the student is enrolled in one or more courses. It then automatically generates tuition charges for them based on their enrollment and the schedule's tuition brackets. Go to an individual student's Profile > Financial > Dashboard view, click add a default tuition schedule, and make your selection. You can also add a tuition schedule on the By Term view; this does not automatically carry forward to future academic terms! You can associate tuition schedules with academic programs. Then, after adding that program to a student, the associated tuition schedule will automatically be added as the student's default. You can add tuition schedules en masse to a group of students using the Data Slicer. Run a report, click actions, and select Manage Tuition Schedules. You can invoice charges in the same places where you can view pending charges. On the student's Profile > Financial > By Term tab, click the gear, and select Invoice Pending. Check the charges you wish to include in this invoice and click Invoice Now. On the Billing > Current > Pending Charges report, click Actions and select Invoice. Enter a due date and a posted date, and confirm you wish to invoice all these charges for all of these students. 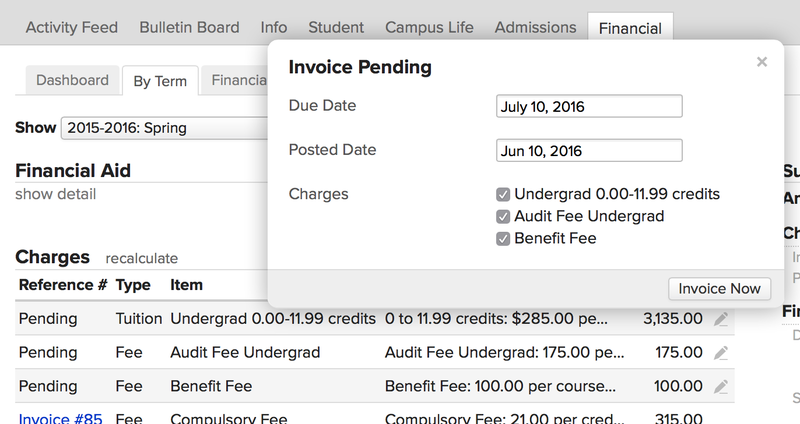 Once you invoice charges, those charges are now part of your students' permanent financial record (and your school's, for that matter). Invoices cannot be deleted or altered after you create them. However, if you make a mistake, you can void the invoice. More often, though, you'll now want to make sure those invoices get paid! When students (or others) pay their invoices, you need to record those payments. To record a payment by cash or check, go to the a student's' Profile > Financial > Dashboard view. Click the gear and select Record Payment. You can also apply credits and unapplied payments to unpaid invoices. You can find a student's unapplied payments/credits on their Financial Dashboard or Billing > Current > Unapplied Payments/Credits. On the student's Dashboard, click apply next to a payment or credit; the rest of this process works just like recording a payment. If you've enabled Online Bill Pay, students can pay directly by credit/debit card; they (and you) can also send another person a link to the student's payment page. Of course, you can also apply Financial Aid to invoiced, aid-eligible charges.